With its big, exotic bird-shaped blooms atop long, sturdy stems and surrounded by leathery green leaves, the bird of paradise plant (Strelitzia reginae), is a colorful tropical plant that is most easily propagated by division. 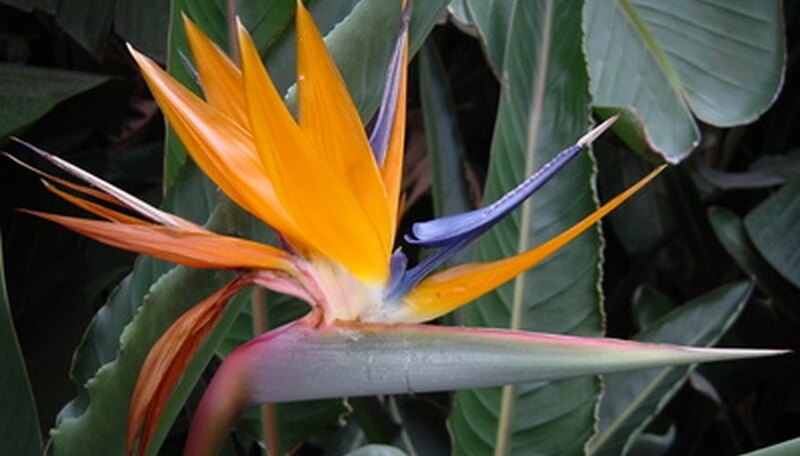 Divide the plant in early summer, and in one or two years, you'll have a mature, flowering bird of paradise plant. Bird of paradise, a native of South Africa, is not frost-tolerant, and will only grow in warm, humid climates. Prepare a spot for the newly-divided bird of paradise plants about a week ahead of time. Choose a well-drained spot where the bird of paradise will get bright morning sun, but will be protected from the hot afternoon sunlight. Remove any rocks or weeks from the area, then use a shovel to work the soil to a depth of 10 to 12 inches. Locate a clump growing at the base of the bird of paradise plant. Using a garden fork, dig around the entire clump to loosen the roots, then lift the clump from the ground. Rinse the excess dirt from the clump with a garden hose so you can see the natural plant divisions. Divide the clump into smaller sections. Be sure each section has a healthy root system. Discard any unhealthy sections, or sections with brown, spongy roots. Soak the newly-divided bird of paradise plants in a bucket with a mixture of 10 parts water and one part household bleach. Allow the divisions to soak in the bleach mixture for 10 minutes. Dig a hole in the prepared spot for each bird of paradise division, then plant the division at the same depth at which it was previously grown. Water the area deeply, and keep the soil moist until the bird of paradise roots, which will take about three months. When new growth emerges, which indicates the plant has rooted, fertilize the bird of paradise plant with an all-purpose granular fertilizer. Sprinkle the fertilizer around the plant according to the package directions, and water it well. Rinse off any fertilizer that inadvertently lands on the foliage.